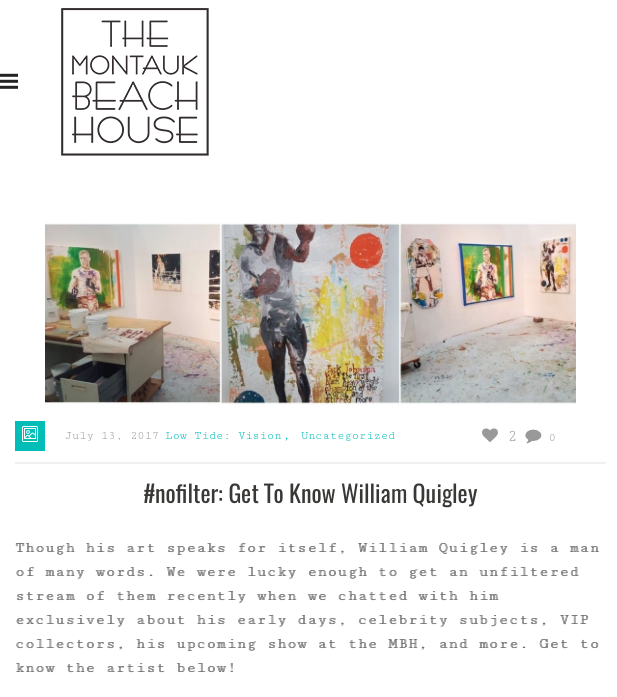 William Quigley was asked to curate a show and create a series of new Skrapper paintings for the lobby of the beautiful Montauk Resort in July 2017. 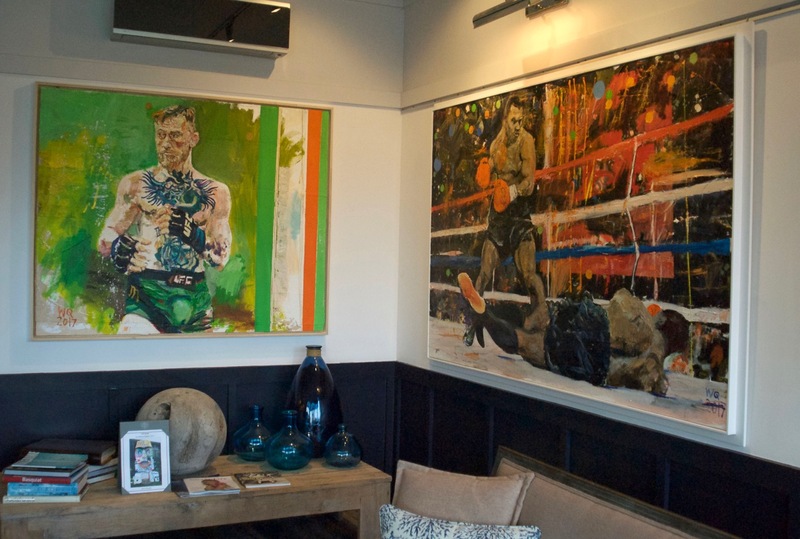 For the month of July the hotel hosted a Boxer Theme with an Opening Party and Reception celebrating Quigley's new works through his Fashion Branding company Skrapper. 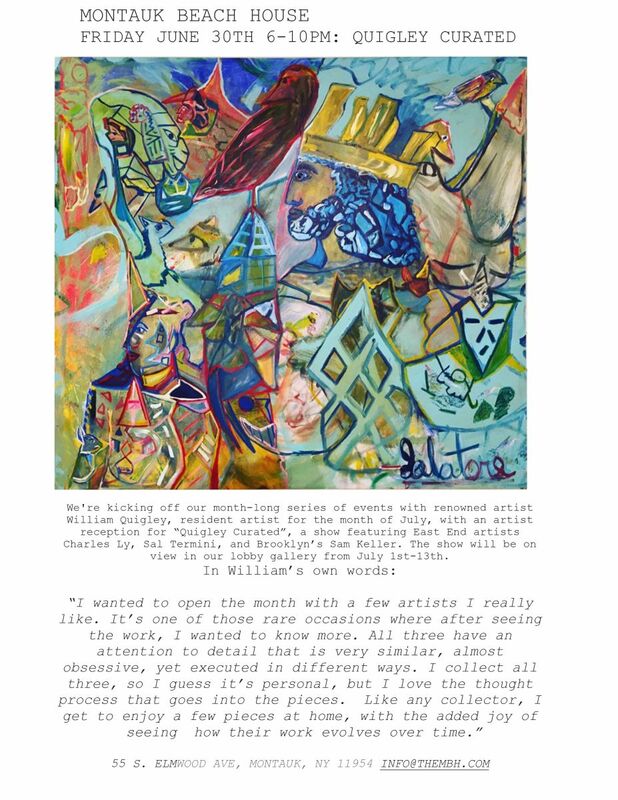 William Quigley curated a show featuring local East End Artists Sal Termini, Samuel Keller and Charles Ly, who he also Collects. The Ronjo in Montauk was built in 1961 by Irv and Flo Stewart on their Hotel Property The Ronjo. The MOAI statue has been called Ronjo since. It's one of the most photographed landmarks in all of Montauk, NY. I was asked to paint over the Gold Ronjo by Larry Seidlick the new owner of the Ronjo, now The Montauk Beach House. I was overwhelmingly humbled, when Larry and hotel genius designer Walt Lindveld asked me to do this. I literally looked up in the sky and said a nice little prayer. Larry had told me so much about the history of the Ronjo Hotel and the statue. Walt seems to be able to dissect all of Larry’s intellectual concepts and present them creatively into such sophistication and grace, all while being an incredibly innovative designer. I try to take that approach with my art, especially with the historical relevance of the Iconic Monument. I decided to start studying and integrating the MOAI history, mixed with the chronological story of the Ronjo hotel into the painting. 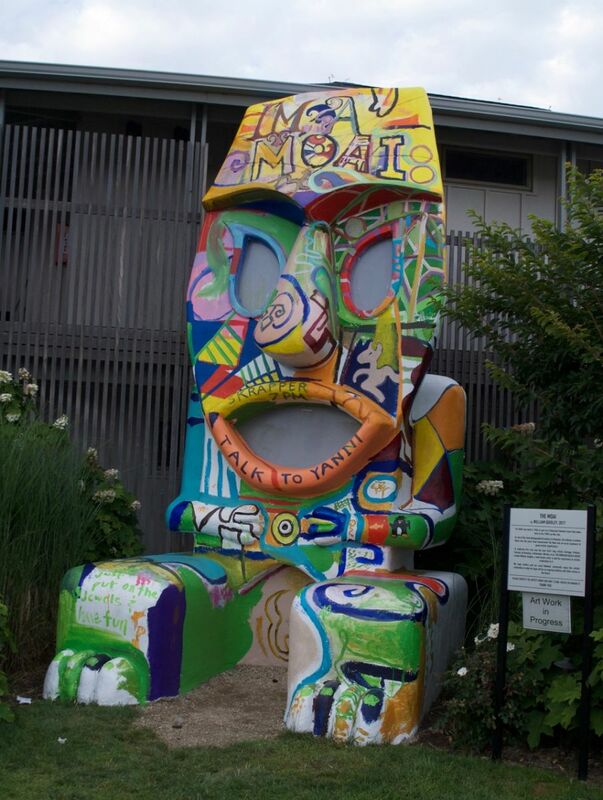 What was the function, purpose and reason for the MOAI/Tiki. That is what I hope to reveal upon completion of the piece. I think also it’s a great gateway to allow other artists to paint on it in the future and further expand on an already growing artistic community out here that is now getting national, maybe even global attention. Not For Sale on view at The Montauk Beach House Resort. I've been painting since 1985 this is the first out door plaque dedicated to my work ever. 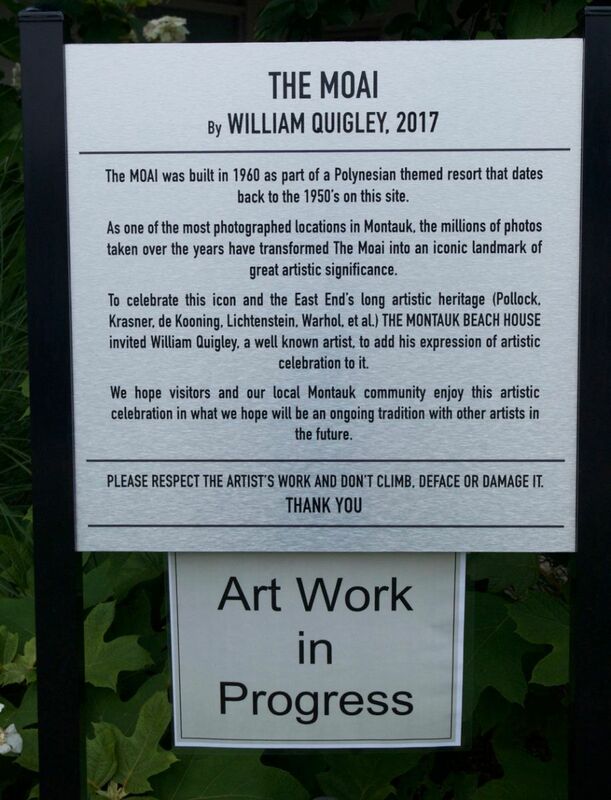 I'm more than honored and thankful to Larry Seidlick, The Montauk Beach House and the East End Community. I think painting Ronjo, the MOAI it’s a great beginning and gateway to allow other artists to paint on it in the future and further expand on an already growing artistic community in the EAST END , that is now getting national, even global attention. Humbled. Now all I have to do is Finish it. I Always thought one should be Prepared Emotionally, Intellectually, and Psychically before getting in the Ring. 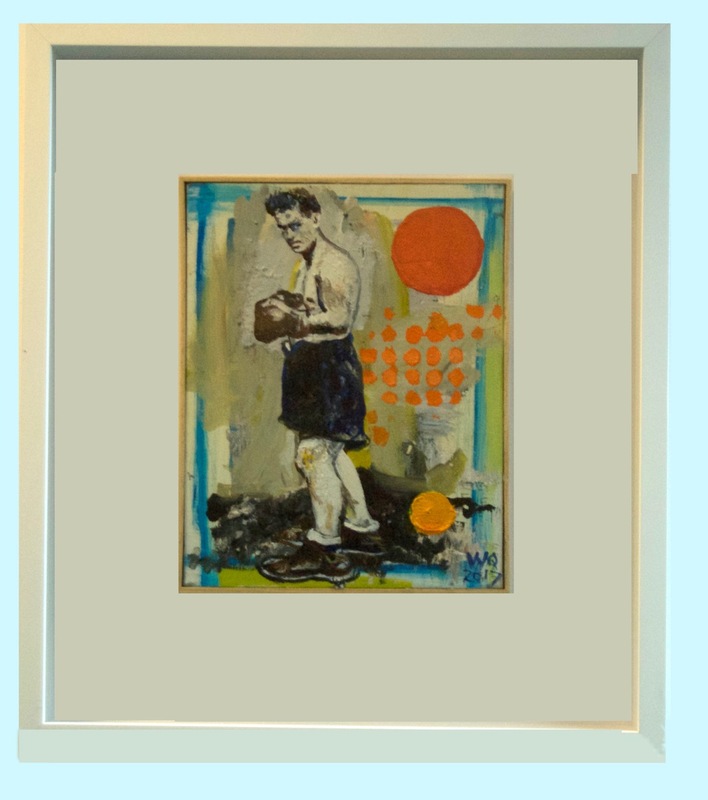 In 1999 I started painting a series of turn of the century boxers and pugilists named Scrappers by their contemporaries. Struggling to make a living painting, I started to see some similarities between athletes, prize fighters and artists, who all "train" hard for their next meal while fighting to pay the bills. My metaphorical comparisons led to a company I called "Skrapper". 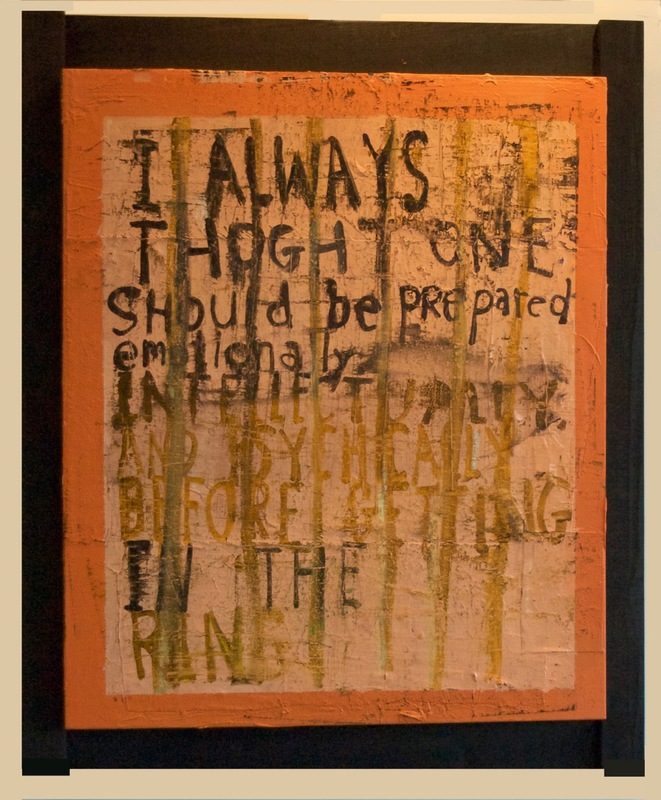 It's concept was in order to compete, be prepared Emotionally, Intellectually and Psychically to get in the Ring, or otherwise the "Art World." 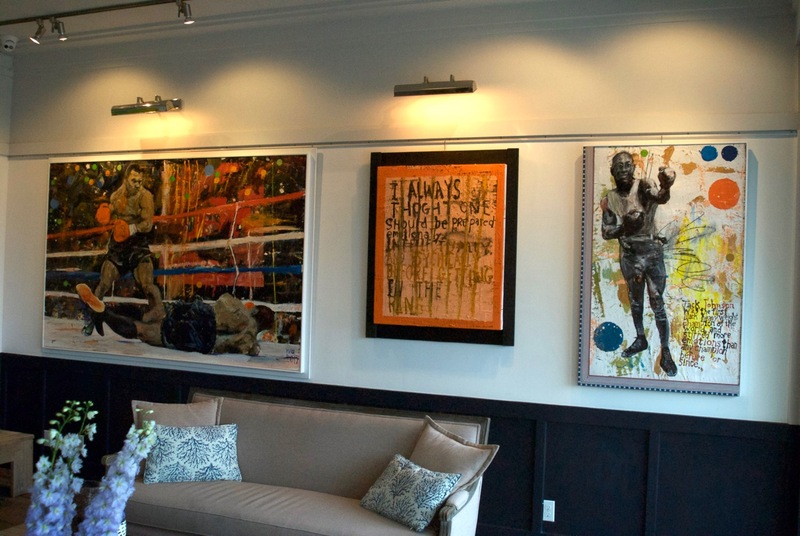 The boxers were specifically chosen as subjects for my struggle while learning how to become a better painter. Writing in painting, and words as content has always intrigued me. Price Upon Request Karl Hutter Fine Art. I decided to paint Mike Tyson for a few reasons. This painting is a homage to an Era that may be ending. The sport is drastically changing. Tyson, Lewis, Holyfield may be the last great, colorful HeavyWeight Champions. Trevor Berbick vs. Mike Tyson, billed as "Judgment Day", was a professional boxing match contested on November 22, 1986 for the WBC Heavyweight Championship. Tyson had gone 12–0 in the year of 1986 alone and officially qualified for the unification series with a second-round knockout victory over Alfonso Ratliff in September. Though the 32–year old Berbick entered the fight as the champion, he was installed as a 3–1 underdog to Tyson, 20 years old, was 12 years younger than Berbick and trying to surpass Floyd Patterson as the youngest man to win a major Heavyweight title in the history of the sport. He accomplished that feat by ending the fight at the 2:35 mark of the 3rd Round, hitting Berbick with a right to the body followed by a left hook to the head that dropped the Champ for the second time. Berbick attempted to get up twice, only to collapse both times, causing referee Mills Lane to call the fight and award Tyson the victory via technical knockout. He became the youngest Heavy Weight Champion in Boxing History at 20 years old. UFC, MMA fighters are demanding more attention among younger fight fans worldwide while competing . The caged arena, and no holds barred rules, is attracting thousands of hungry, new spectators that no little about boxing history. The love for blood and open fist punches, kicks, and an aggressive band of personalities willing to fight for a lower purses as they rise in the ranks has captured the blue collar hearts of American Sports Fans. 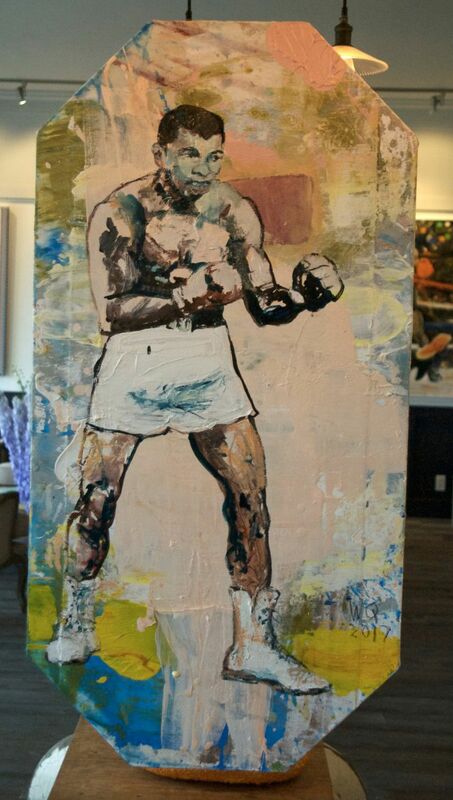 Quigley painted Ali, Cassius Clay over 10 times since 2000. 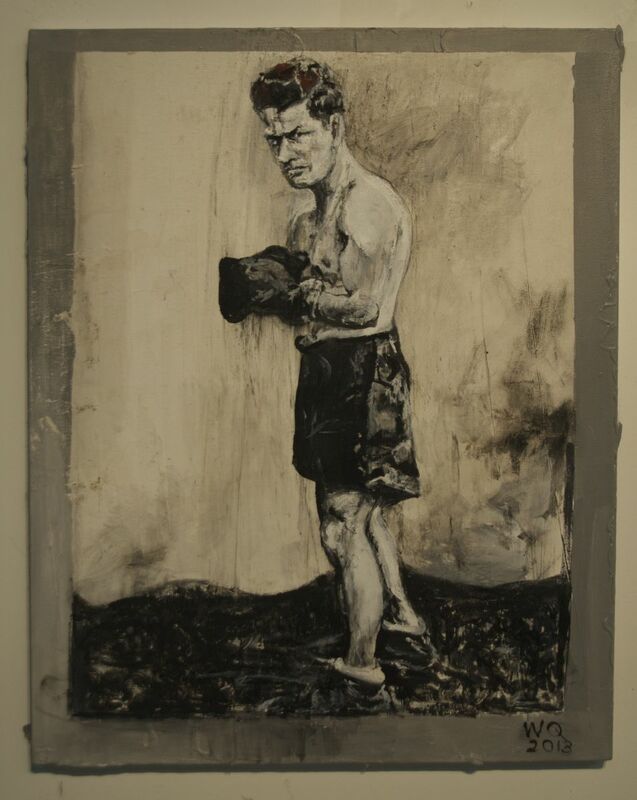 This is one of his most ambitious attempts using a shaped canvas for the first time in the boxer series. SOLD / Karl Hutter Fine Art. 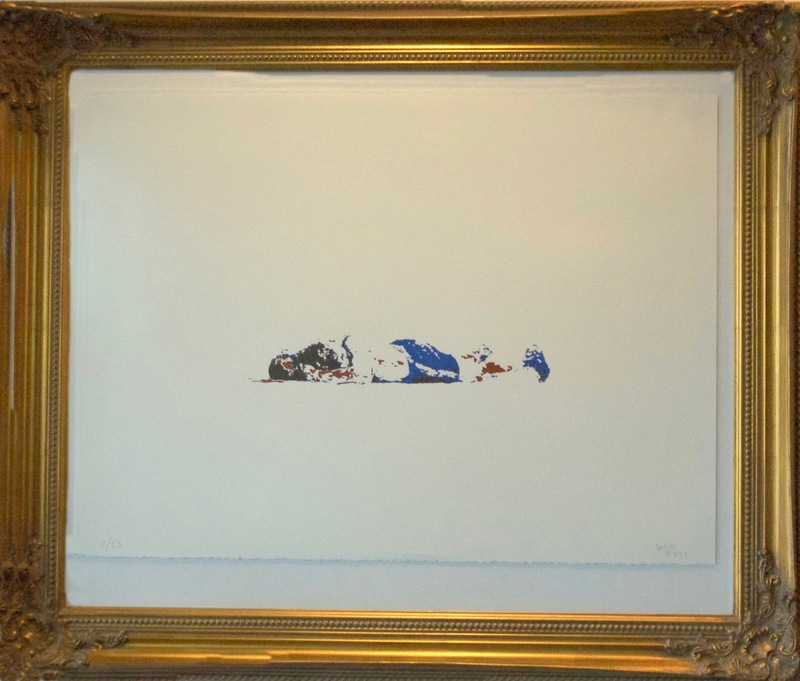 This KO motif has been prevalent in Quigley's boxing paintings since 1999 when he started the Skrapper paintings. The symbolic mystery creates an open forum and question of whether the fighter will rise and continue competing or fall to the more common path of exhaustion. Again like in most of his subject matter, this image can be an objective metaphor rhyme reflecting a variety of directions and walks in life. Already the U.S. Expeditionary Forces champion, Tunney spent the winter of 1921 as a lumberjack in northern Ontario for the J. R. Booth Company of Ottawa, without revealing he was a champion boxer. He explained this as "wanting the solitude and the strenuous labors of the woods to help condition himself for the career that appeared before him." Tunney also had a brief acting career, starring in the movie The Fighting Marine in 1926. Unfortunately, no prints of this film are known to exist. He was elected as Ring Magazine's first-ever Fighter of the Year in 1928 and later elected to the World Boxing Hall of Fame in 1980, the International Boxing Hall of Fame in 1990 and the United States Marine Corps Sports Hall of Fame in 2001. SOLD to Josh and Kate Prueher. Conor McGregor (Irish: Conchúr Antóin Mac Gréagóir; born 14 July 1988) is an Irish professional mixed martial artist and professional boxer who is currently signed to the Ultimate Fighting Championship (UFC). He is the reigning UFC Lightweight Champion, and former UFC Featherweight Champion. 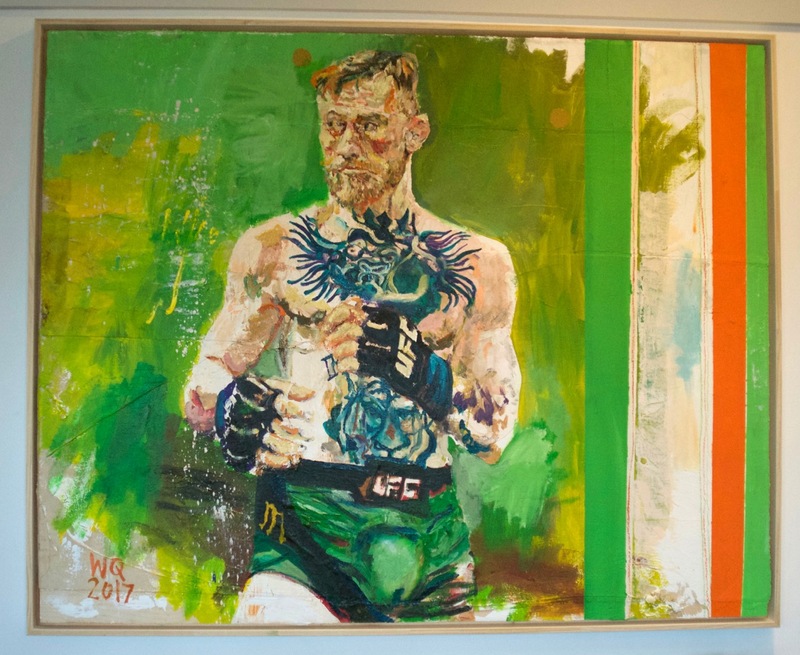 This painting was finished in July 2017 in anticipation of McGregor's epic battle with Floyd Mayweather. The rise of UFC, and the hyped up integrated match brought the theory to the forefront that Heavy Weight Boxing has reached maybe the end of its long Celebrated American History. The series created for the Montauk Beach House is the first time Quigley has painted boxers in 4 years, only taking rare commissions. Price on Request Karl Hutter Fine Art. 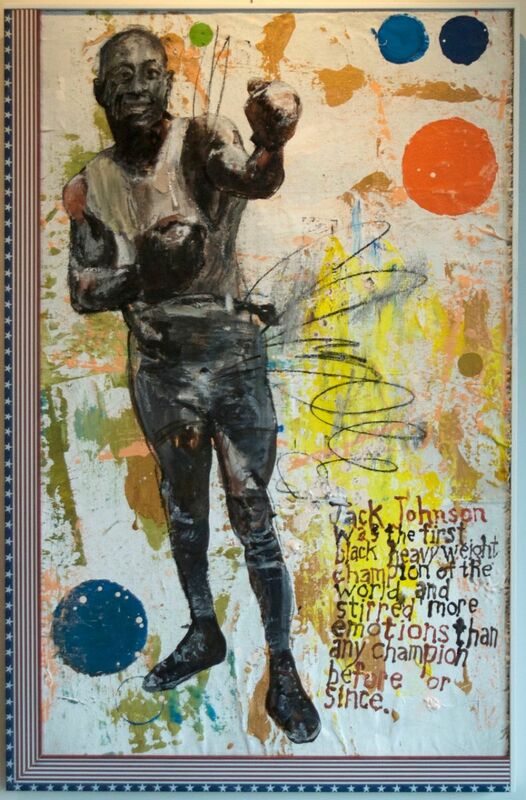 Following the theme and idea that Heavy Weight Boxing may be reaching an End it was only natural to paint legend Jack Johnson, the first Black heavyweight champion. 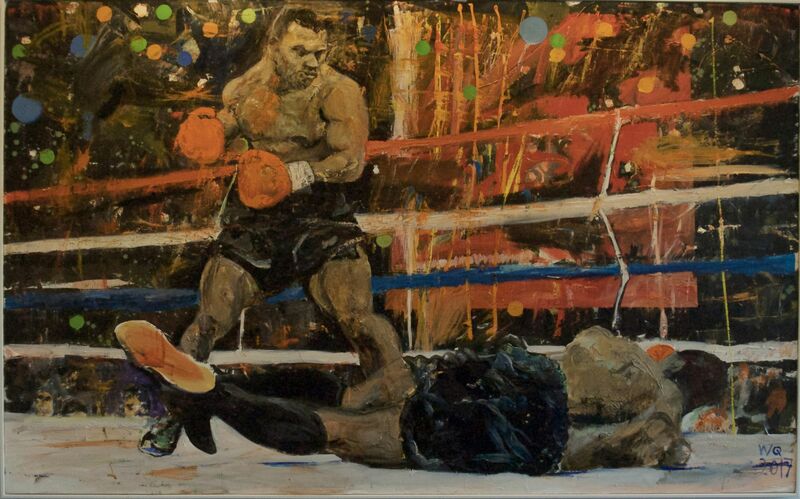 Making 4 paintings of Johnson to date, and being one of Quigley's favorite fighters and personalities, it was only natural to paint the Champion again for this exhibit. John Arthur "Jack" Johnson (March 31, 1878 – June 10, 1946), nicknamed the Galveston Giant, was an American boxer, who—at the height of the Jim Crow era—became the first African American world heavyweight boxing champion (1908–1915). Johnson went on to become one of the most dominant champions of his time, and remains a significant historical figure in heavyweight boxing history, with his 1910 fight against James J. Jeffries being dubbed the "fight of the century." Johnson was faced with much controversy when he was charged with violating the Mann Act in 1912, even though there was an obvious lack of evidence and the charge was largely racially based. 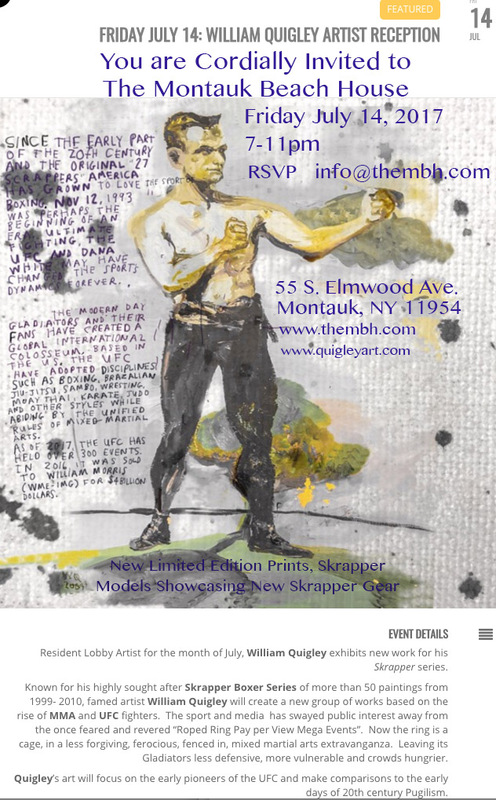 In a documentary about his life, Ken Burns notes that "for more than thirteen years, Jack Johnson was the most famous and the most notorious African-American on Earth"The series created for the Montauk Beach House is the first time Quigley has painted boxers in 4 years, only taking rare commissions. I saw this great Mondrian painting in Washington DC at the Phillips Collection. 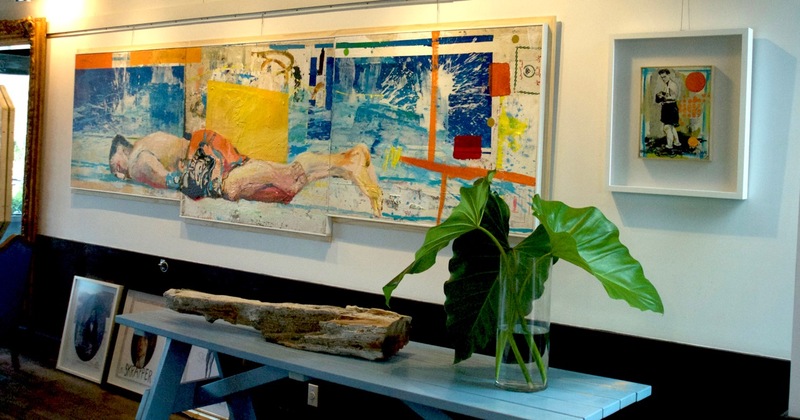 The painting gave me ideas to start framing my small figurative and abstract paintings behind glass , and a frame within a frame. I asked the brilliant framer Dan Meeks at BordersFraming NY to help execute these concepts. We have made about 20 paintings in this manner. It allows you to really see the piece, giving it a reverence that allows you to focus on the color and marks in the painting. I love supporting anything Military. Tunney was a Marine. He was a Natural Skrapper. Tunney was a thinking fighter who preferred to make a boxing match into a game of chess, which was not popular during the times when such sluggers as Jack Dempsey, Harry Greb and Mickey Walker were commanding center stage. Tunney's style was influenced by other noted boxing thinkers such as James J. Corbett and Benny Leonard. Created at Boston University in 2011 The first in a series of 4 Silkscreen Prints. Prce Upon Karl Hutter Fine Art.